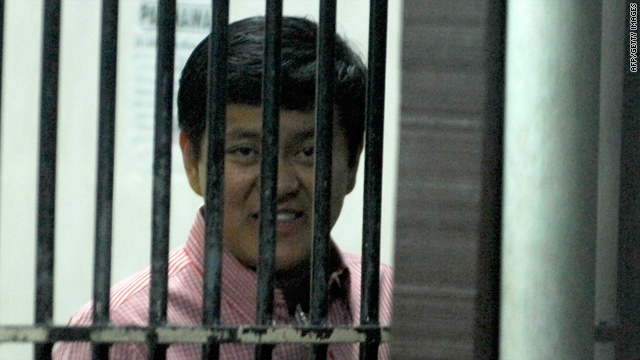 Datu Unsay Mayor Andal Ampatuan Jr. is pictured inside his cell in Manila before being escorted to the Philippine National Police Headquarters in Quezon City for his arraignment on January 5. (CNN) -- A member of a politically powerful family in the southern Philippines pleaded not guilty to dozens of murder charges filled against him in connection with a November massacre in Maguindanao province, Philippine news outlets reported. Datu Unsay Mayor Andal Ampatuan Jr. pleaded "not guilty to all the 41 charges," Leila de Lima, chairwoman of the Philippine Commission on Human Rights, told reporters at Camp Crame where the trial is being held, CNN affiliate ABS-CBN said. Ampatuan could face an additional 16 charges in the Nov. 23 massacre that killed 57 people. Authorities have said the killings were part of a politically motivated attempt to keep an opponent of the politically powerful Ampatuan family from running for governor. Thirty journalists were among those killed. Authorities raided a warehouse and ranch belonging to the Ampatuan family last month and confiscated firearms, ammunition and vehicles, Maj. Randolph Cabangbang, deputy of operations for the eastern Mindanao command, said at the time. Following the killings, Philippine President Gloria Macapagal-Arroyo declared martial law on Dec. 4 before lifting it eight days later, saying it had achieved its objectives.